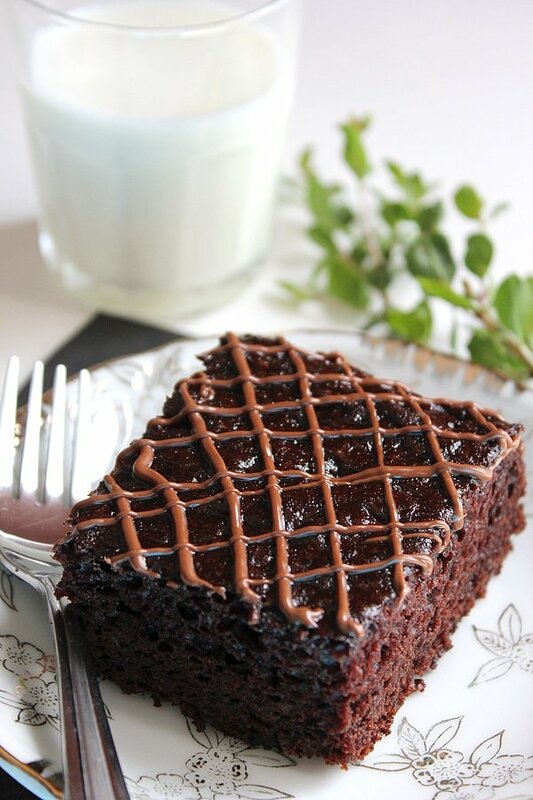 Why did I come up with Eggless Nutella Chocolate Cake recipe? 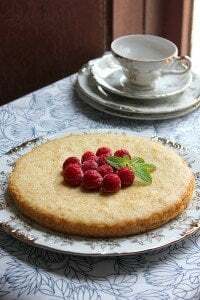 I have been trying to come up with different eggless cake recipes, since some of my readers are allergic to eggs, or have kids who are. I know how kids enjoy eating cake especially chocolate cake, and when your kid is at a birthday party where everyone can enjoy the cake except him, it can break your and his heart. 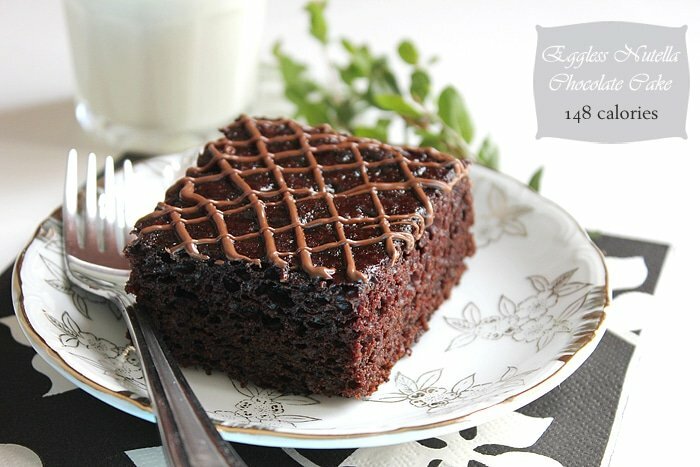 Today I’m sharing this amazing Eggless Nutella Chocolate Cake with you, it is very moist and will remind you of the chocolate cake mix sold in a box, but this cake tastes far much better and is good for you since you know what’s in it. 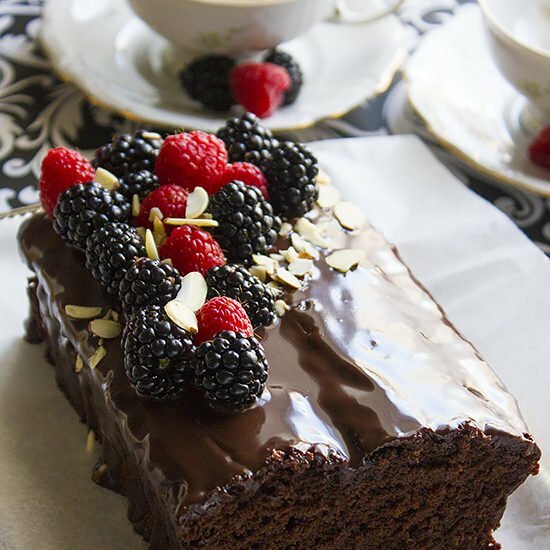 This cake was a big hit and everyone enjoyed it, you can never tell that it’s eggless, and the best part is it stays moist even after two days. You can use it as a Birthday cake, or bake it in cupcake liners. 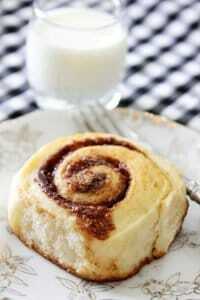 In a blender, add apple, milk, sugar, vanilla, oil, cocoa powder, and Nutella. Blend until smooth keep aside. In a separate bowl sift or whisk all the dry ingredients. Add the wet ingredients to the dry and gently stir using a whisk or a spatula. Do not over mix. Pour the boiling water into the batter and stir to combine. Pour the batter in 8×8 greased and floured baking pan, or you can use parchment paper, which I feel is best for this cake. 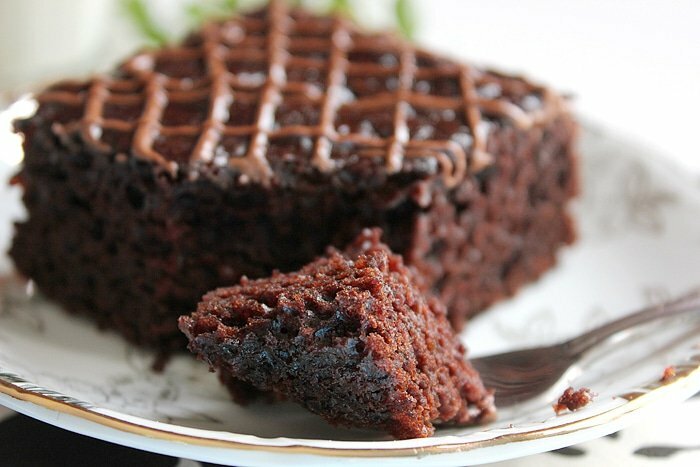 Bake for 30 minutes, then insert a toothpick in the middle, if it comes out clean, your cake is ready. This cake should stay in the baking pan to cool, then refrigerate for at least an hour before serving. This cake needs to be refrigerated for one hour for the flavors to come together. Cut into 12 squares. 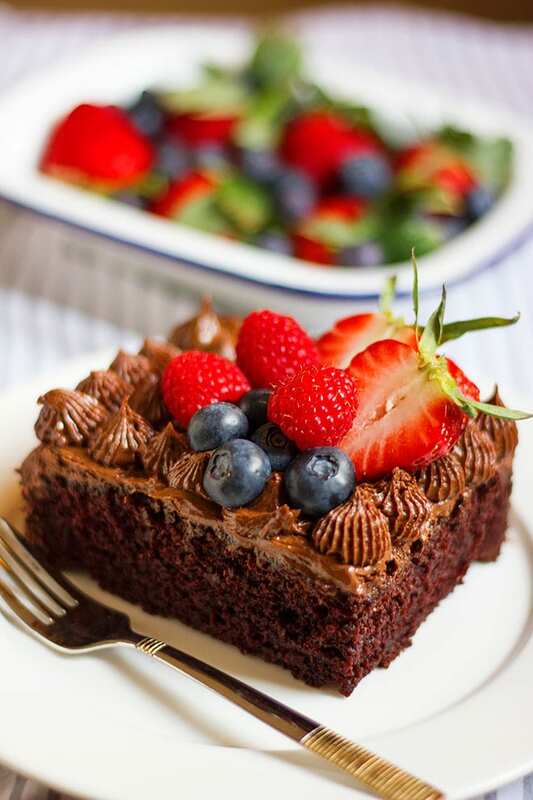 ***Note: The lines on the cake created by using Nutella, and is not included in the calorie counted. 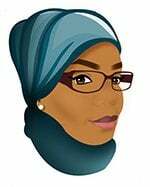 I see that you use baking soda for the cake, so I will resume that cocoa powder you used is not Dutch-processed? The cake does look very moist and beautiful, Muna. Hi Angie, the frosting (lines made from Nutella) are not included in the calories counted. You are right, I’ve used unsweetened cocoa powder. p.s What is boiling water for? Didn’t see it in the baking directions.. I have limited baking knowledge and I am always interested in finding out how some baked goods don’t need eggs and flours but it turn out so well. It’s a bit mystery to me (for savory food, cooking seems obvious to me). 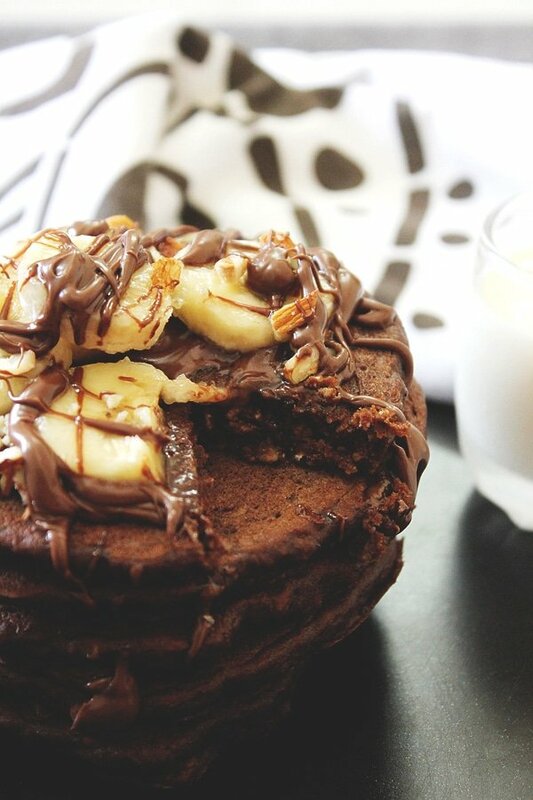 Looks like a wonderful chocolate cake, and nutella? My favorite! Looks so good!! I never bothered to try baking without eggs before, until I started baking for my son’s school and came to know the number of kids who can’t enjoy cakes because they are allergic to eggs! It’s fun and sometimes my attempts fail too, but this time it succeeded. So happy I found this cake via Pinterest! Looks fabulous and so simple! 🙂 Pinned! so tasty and moist looking cake..
My little brother is allergic to egg,nuts,glotin,soya&milk,, and his birthday is soon, do you have any suggests for cake with frosting?? There are many frosting that are dairy free, unfortunately I don’t have one on my blog. Thank you 🙂 … I think finding different ingredients to replace eggs in baking is fun, and I look forward to baking more eggless goodies! 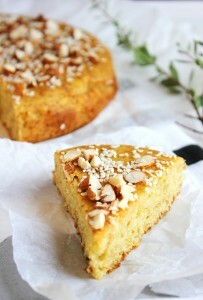 The apple acts like an egg when cooked and make the cake moist. That is true, but when the eggs are not used, the combination of the ingredients I’ve used including the apple give the cake the texture achieved when using eggs. Hi Munaty this looks great! Can i skip the apple and use buttermilk or vinegar? Considering its just a substitute for egg ! 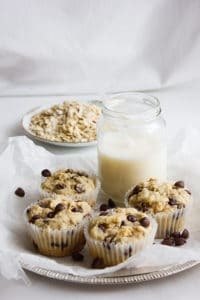 Hi Bhagya, I’ve never tried to use buttermilk or vinegar as substitute in this recipe, and not sure if using vinegar will make this cake as moist as when using apple. You will not taste the apple in this cake at all if that’s your concern. I use measuring spoons, it is a set of 1 tablespoon, 1 teaspoon, etc. These spoons can be found as plastic or metal. Hi, You can use any vegetable oil, sunflower, canola, or corn oil, but it shouldn’t be olive oi since the taste will take over. I just had a really stupid question but it’s my first time baking an eggless cake and because it’s for a friend I want to get it perfect. How many grams approximately would the apple be. I can only find tiny ones so I thought I’d add accordingly. Again sorry for asking such a stupid question. Hey, nice looking cake! I want to try it, but one question before that. Can i use applesauce instead of apple? Thanks! Hi Ritu, I’ve never used apple sauce in this recipe, but I think it’ll be ok! 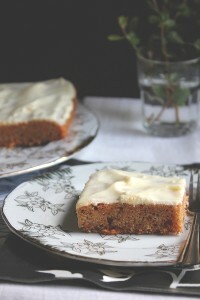 I substituted the vegetable oil with virgin coconut oil which added a really nice flavor to the cake. I also reduced the sugar to half and added bananas instead of apple. Overall it turned out to be very moist and delicious. Thanks for such a nice recipe. I made the cake for a friends birthday! It was delicious and we ate it all in one sitting. I used Nutella and peanut butter as frosting on top, also delicious. Thank you for such a great recipe! Wow! I’m so happy you’ve tried my recipe 🙂 … Nutella and peanut butter frosting sounds delicious! This cake looks so good and I will try it soon – but the TINY portion size is too unrealistic for me! Hey, lovely recipe u got there. I am planning to try this in two days, was wondering why kinda apple did u use? Red or green? Hi Vinitha, Ive used red apple. Have u spread ganache before drawing Nutella lines? Hi Rekha, no I haven’t, but the cake is very moist hence it has a shiny surface. Hi ! This cake looks so goooood ! Just wanted to ask… will the taste of nutella come through in the cake.. as we are using only 2 tblsp of it?? Best tasting eggless cake ever. Munaty but every time in see dry flour unmixed and few lumps but am careful not to over mix. What’s the solution for a smooth batter? I’m sure you can but I don’t know how long it takes. Hii can I make this cake in microwave also ? Hi Savi, I never made it in the microwave, but I guess you can, but I’m not sure how long it will take! To some I’m probably committing a sin by letting a jar of Nutella sit in my pantry. For some reason I just can’t get with the Nutella movement. 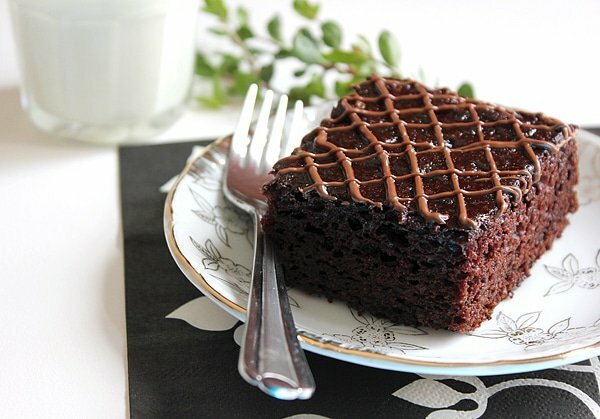 But this cake…I might be able to get with Nutella if it’s in a cake. It’s definitely worth a try! 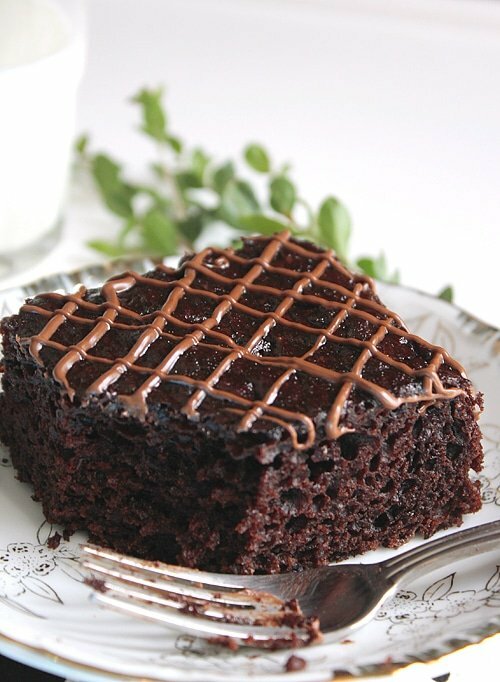 It looks so moist and absolutely delish! You really pulled this one off! YUM!